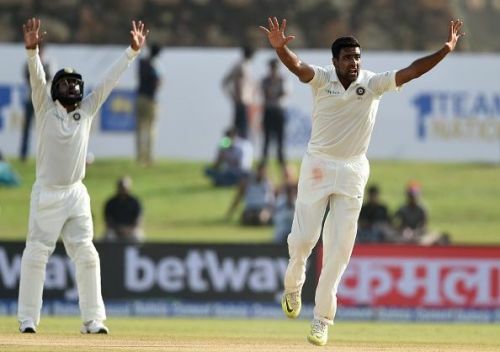 After the Indian cricket team put on a massive total of 600 on the board in the first innings of the first Test being held at Galle, they performed equally well with the ball and restricted the home side to 154-5 at the end of day 2. Umesh Yadav had got India off to the perfect start dismissing Dimuth Karunaratne in the 2nd over of the match. The Sri Lankan batsmen fought back with a 61 run partnership for the 2nd wicket but Shami struck twice in one over to put Sri Lanka in a spot of bother. However, Tharanga and Angelo Mathews led the revival once again and put on a 57 run partnership for the fourth wicket. Both the batsmen were looking in fine touch with Tharanga scoring a half century as well. However, an unfortunate incident led to his dismissal in the last ball of the 34th over. 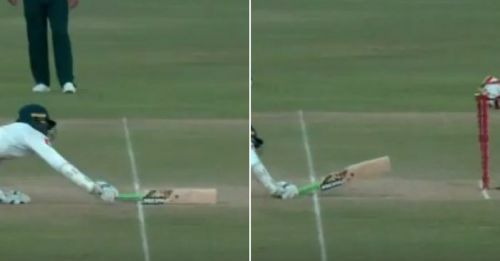 With Jadeja bowling, Tharanga looked to go down the pitch but as the ball dipped he jabbed it to Abhinav Mukund who was fielding at silly point. He swiftly gathered the ball and released it to Saha, who flipped the bails off. Tharanga had to undo his steps and as he hastily dived back again, the bat bounced up in the air by the time the keeper broke the bails. The opener was caught short. It was a sharp piece of work from Abhinav. He went low, picked up the ball with both hands, and under-armed it to Saha who did the rest. Earlier in the day, India began at 399-3, but it did not take long for Sri Lanka to strike as they removed Cheteshwar Pujara after he scored 153. Rahane too departed shortly after scoring a half century. Ravichandran Ashwin performed well with the bat with a worthy contribution of 47. After a couple of quick wickets, debutant Hardik Pandya put on a show for the spectators and scored a quick fire half century in just 49 balls with five fours and three sixes to his name. Mohammad Shami exceeded expectations and scored a run a ball 30 and put on a 62 run partnership with Pandya .